Check out the works of Richard M. Mulder right here. 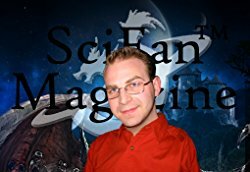 World renown today as “The Godfather of SciFan”, Richard M. Mulder is the founder of the Science Fantasy Society and the Co-Producer of SciFan™ Magazine. To stay up to date on everything SciFan (including #SciFanCon), sign up for SciFan newsletter . The world’s largest gaming platform in the entire industry is led by a man with many secrets. The popular game DarkForce features the World of Zion which has been plagued by the destructive will of the Leviathan for centuries. What gamers don’t know is that the World of Zion actually exists, and the Leviathan has fed off of the souls of men and his fodder has become scarce. He now turns to Earth with an insatiable hunger. Only a woman from Earth who levels up to discover a divine inner power can challenge Earth’s Apocalyptic Fate. “Conquest” is a prequel story that explores the oft-unanswered question of why and how gamers get stuck in the game. Be aware that if you are looking for a hard-core LitRPG story, this one probably isn’t for you. I intend to write book 2, “War”, in a manner where readers could skip “Conquest” if they so desire. That said, I hope you enjoy my apocalyptic-themed story!